It takes a village to raise a child. It only takes one man to trick that whole village into turning on that child. So were now on the seventh book in the series and things are really getting going. Mr Poe is having trouble finding anyone willing to take on the three Baudelaire children due to everything that has happened between them, Count Olaf and all their previous guardians. With no-one willing to take them in and be their guardian Mr Poe has nothing left to do but send them to an aphorism meaning it takes a village to raise a child. This is a village where the whole population of the village take on the role of guardian and raise the children. 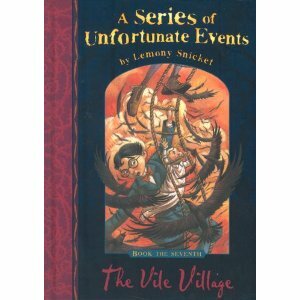 Mr Poe gives the Baudelaire's a list of different villages to chose from and the minute the children see the one named V.F.D they instantly chose that one. As this is the last thing the Quagmire's shouted to them as they were being kidnapped. Before long and after many plot twists Count Olaf is on the scene and this time he has framed the Baudelaire's for murder but not just any murder he has framed them for the murder of himself. Do the Baudelaire's find the Quagmires in time? Can they get away before burned at the stake? Can they convince anyone that they didn't murder Olaf and that Olaf is actually still alive? Out of all the seven books i have read in the series this one is my favourite so far. I got really into trying to figure out Isadora's messages and i loved the plot twist of the Baudelaire's being blamed for Olaf's murder and Olaf disguising himself as a detective and investigating his supposed on murder. I am excited to see what happens to the Baudelaire's next as they go out alone but i am also glad they have gotten rid of Mr Poe as he is bloody useless and as Snicket has written many many times in each book "he was extremely prone to error" in other words he was absolutely useless. I also can't wait to find out what happens to the Quagmire triplets and Hector. In conclusion another 5* review on goodreads although if i could i would of given this one 6* as i enjoyed it that much. I am suffering with insomnia at the moment and haven't slept in well it will be 3 nights tonight and the only thing keeping me from loosing my mind at the moment is reading this series.